A team of researchers from INESC TEC’s Centre for Telecommunications and Multimedia (CTM) and Centre for Robotics and Autonomous Systems (CRAS) is developing a technology “that allows autonomous underwater vehicles (AUVs) to approach underwater sensors without battery, energising them and collecting data". Project ENDURANCE – Underwater wireless energy and communications enabling long-term deep-sea presence – focuses on the development of an underwater wireless energy transfer system, an underwater optical communications system, and a navigation and perception system. As the project leader, Luís Pessoa, explains, the goal is to bridge "the well-known concept of Radio Frequency Identification (RFID) to the underwater world". 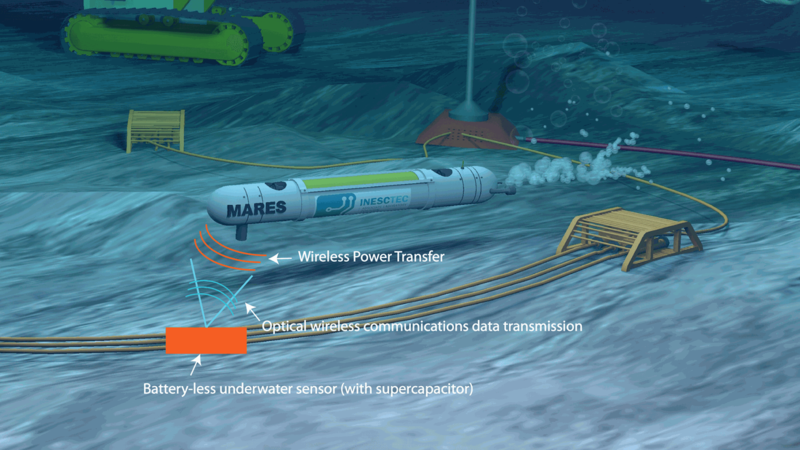 Luís Pessoa emphasises the importance of this technology for the "perpetual sensors operation in an underwater environment, allowing a considerable reduction of costs", for example, by avoiding the replacement of sensor batteries, providing "enough power for its operation until the next access". The team, which is coordinated by Luís Pessoa, is composed of Cândido Duarte and Henrique Salgado (from CTM), Aníbal Matos, Nuno Cruz and Bruno Ferreira (from CRAS). This work is financed by the ERDF – European Regional Development Fund through the Operational Programme for Competitiveness and Internationalisation - COMPETE 2020 Programme and by National Funds through the Portuguese funding agency, FCT - Fundação para a Ciência e a Tecnologia within project POCI-01-0145-FEDER-031971.